Last Sunday night, while riding a bus across Shanghai, I pulled a bottle of water from the side pocket of my backpack and unscrewed the cap. As I raised it to my mouth to take a drink, an elderly man in the seat behind me reached forward and tapped me on the arm. Nongfu Spring is the brand of water I was drinking; it’s one of the cheapest brands available in China and produces a fifth of the bottled water purchased in the country. I almost always buy it, primarily because it’s usually the only brand the convenience store outside my apartment building sells in 1.5-liter bottles, the largest size that fits in my tiny fridge. But now, I immediately guessed, it had become the latest product to fall under scrutiny in China’s never-ending parade of food-safety scandals. I asked the man on the bus to explain, and he kept it brief. “Nongfu Shanquan bu hao he.” “Nongfu Spring isn’t good to drink.” His wife, seated next to him, silently nodded in agreement. Gesturing to the TV screen at the front of the bus, the man informed me, “I saw it on the news. You shouldn’t drink Nongfu Spring. Buy something else.” And with that, the pair rose from their seats and got off at the next stop. As it happens, I had been away on Moganshan all weekend and had barely spent any time on the Internet during my two-day trip, so I’d missed the news that stores in Beijing were pulling Nongfu Spring from their shelves amid allegations that the water failed to meet quality standards. As soon as I arrived home, I checked Twitter and googled “Nongfu Spring contaminated,” and sure enough, got a list of search results that made me take a half-empty bottle of the water out of my refrigerator and pour it down the sink. The latest news is that Nongfu Spring does, in fact, (allegedly) meet national safety standards, though I don’t plan to switch back from the Nestlé water I started buying instead. 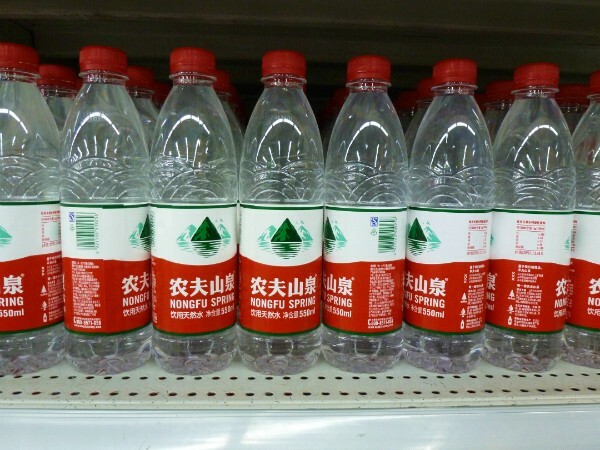 (And, in what can’t be a coincidence, my convenience store began stocking 1.5-liter bottles of that brand only a day or two after the Nongfu Spring story broke.) The couple on the bus notwithstanding, most people didn’t seem especially concerned about the possibility that their water was subpar: I quickly noticed that plenty of Shanghainese continued toting Nongfu Spring’s distinctive red, white, and green bottle. Riding the subway out to Pudong Airport to catch a flight back to the States, I saw a family of four (mother, grandfather, two small children) sharing a single bottle of Nongfu Spring among them. Everyone, I know, has their own particular rubric for making food-safety choices in China. While I try to avoid seafood whenever possible, I regularly eat at small hole-in-the-wall noodle and dumpling joints that others might avoid. I rarely buy anything at imported grocery stores, but there are only a handful of restaurants where I’m willing to order a salad. Other people will make other choices—to avoid chicken (bird flu fears) or lamb (which might really be rat/fox/mink) or non-organic produce. Such decisions have always been part of my life in China, as well as plenty of other places I’ve traveled; it’s very easy to get sick from contaminated food overseas. But in the past couple of months, the constant stream of news stories about food-safety issues in China have changed the calculus a bit. I no longer worry so much that I’ll pick a bad restaurant and suffer short-term consequences. Instead, I’m more concerned about long-term exposure to basic products—like bottled water—that are part of my daily life. … citizens’ initiatives are creating real alternative sources of information and creating transparency through direct action. With transparency comes more pressure: the government either has to clean up the mess or resort to ever more censorship, thus escalating the loss of trust. The media has also become a powerful voice in demanding more accountability from both food producers and the government, as Alexa Oleson explains later in that same conversation, and the fact that the government allows such discussion indicates that China’s leaders recognize the need to address the problem. And, of course, people vote with their wallets. When a KFC supplier was investigated late last year for using too many antibiotics in its chicken, the popular chain’s China sales quickly dropped by a fifth. Making predictions about anything in China is generally a losing game—the country has defied predictions for decades, if not longer—but I’ll say this much: people are tired of environmental and food crises, and seem to be more interested in improving these spheres than any others. I think there are true prospects for change. But for the time being, I still think the smart choice is to make smart choices. And that, for me, means no more Nongfu Spring … because if someone were to ask me, “What’s in your water?,” I wouldn’t have an answer. Great post and great reading, as usual!